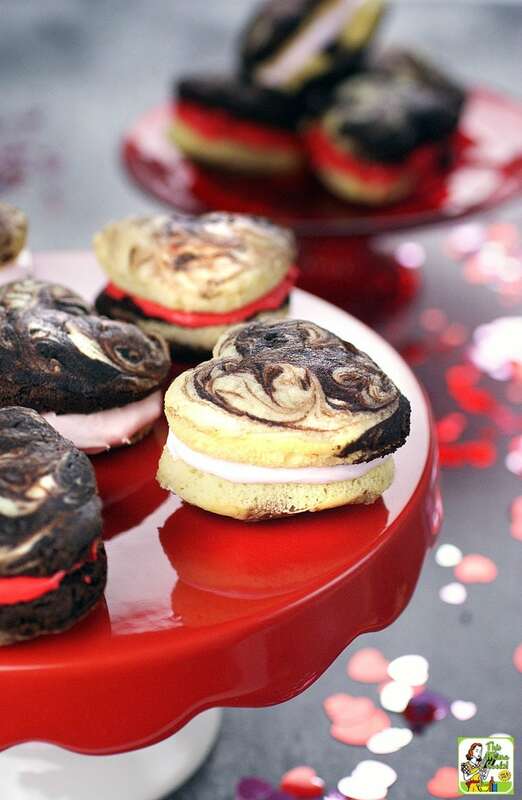 I created an Easy Whoopie Pies recipe for Valentine's Day that’s gluten free and dairy free. 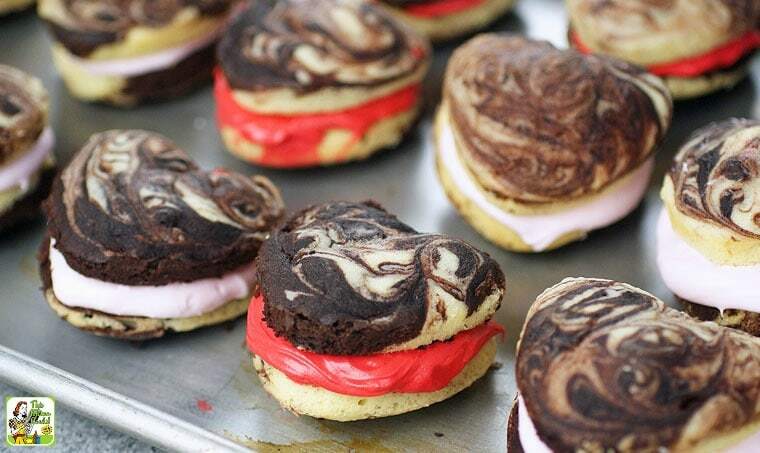 It’s super easy because these are gluten free cake mix whoopie pies made in a non-stick heart shaped whoopie pie pan. I’ll also show you how to create a decadent, ooey gooey whoopie pie filling that’s also gluten and dairy free. What the heck is a whoopie pie? First, when I found the heart shaped whoopie pie pan, I had to do a little research on creating gluten free whoopie pies. Believe it or not, I don’t think I’ve ever eaten a whoopie pie. For some reason, I was under the impression it was like a Moon Pie. Wrong! Whoopie pies are basically a cupcake in sandwich cookie form with a gooey layer of marshmallow cream in the middle. Swoooooon, right? While most of the time people make chocolate whoopie pies, some folks like pumpkin or gingerbread flavored ones. I’ve even seen a vanilla whoopie pie recipe, but there are no hard and fast rules when it comes to flavors. Labadie's bakery in Lewiston, Maine has been making the confection since 1925. The now-defunct Berwick Cake Company of Roxbury, Massachusetts was selling "Whoopee Pies" as early as the 1920s, but officially branded the Whoopee Pie in 1928 to great success. Various claims suggest that the whoopie pie originated in Massachusetts and spread both north and south, or that German immigrants in Pennsylvania brought the predecessor of the Whoopie Pie to communities throughout the northeast. What’s Cooking in America says that whoopie pies were an Amish dessert featured in a 1930s cookbook called Yummy Book by the Durkee Mower Company, the manufacturer of Marshmallow Fluff. Naturally, the whoopie pie recipe used Marshmallow Fluff in the filling! Can you make an easy whoopie pie recipe that’s also gluten free? I'd only baked gluten free cupcakes from mixes. Since I wanted to create a gluten free whoopie pie recipe, I did some research on making gluten free cupcakes from scratch. Let me tell you folks, baking gluten free from scratch is a lot of work. Plus, I didn’t want you folks to go out and buy two or three different kinds of flours, a binder like guar gum, and experiment with adding cocoa powder to all that, too. Plus, there was the matter of making homemade frosting. Us busy folks ain’t got time for that! Obviously, there must be a better way. So how about a cake mix whoopie pie recipe using gluten free Betty Crocker cake mix and gluten free Betty Crocker frosting. Easy peasy with guaranteed results. For the whoopie pie filing, gluten free Betty Crocker frostings mixed with Marshmallow Fluff would be so much easier, too. For Valentine’s Day, besides using a heart shaped whoopie pie pan, I decided to swirl the yellow and chocolate gluten free cake mix together for a cool effect. In addition, I’d make red or pink gluten free whoopie pie filling. Fun, fun, fun! Don’t worry about your results. Worse comes to worse, you’ve completely mixed the two batters. However, your whoopie pie will still look and taste great after baking! If you find swirling too hard after a few tries, make half the easy gluten free whoopie pies with yellow cake mix and half with the gluten free chocolate cake mix. Then make chocolate whoopie pies and vanilla whoopie pies with whatever flavor frosting you picked in the middle. 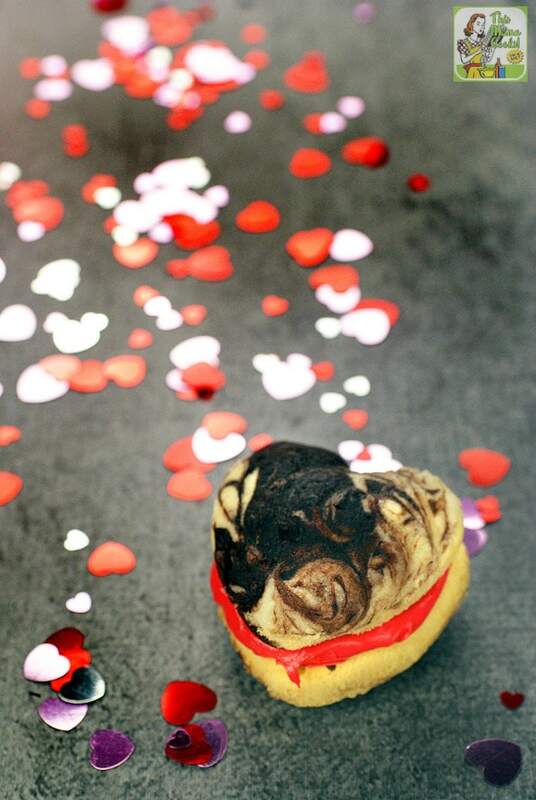 It’ll still be a cute Valentine’s Day treat for your special gluten free sweeties! My other challenge was not only make the whoopie pies gluten free but dairy free, too. I checked the Betty Crocker website and their Gluten Free Devil's Food Cake Mix and Gluten Free Yellow Cake Mix are both dairy free. I also like both the Betty Crocker frostings and cake mixes since you can easily find it at your local grocery store and don’t have to go to a specialty health food store or order it online. But if you have another favorite gluten free cake mix, go ahead and use it. To keep the whoopie pie recipe dairy free, I used a vegan butter spread and unsweetened coconut milk. If you aren’t dairy free, you can use regular butter and milk. Betty Crocker frostings are clearly labeled as gluten free foods. They’re also dairy free. But always check the labels every time you purchase your supplies since ingredients can change. Of course, you can choose any gluten free Betty Crocker frostings that appeal to you based on what you can find at your store or online. Since I made this, Marshmallow Fluff brand has come out with a strawberry flavor. Not only would this be kind of yummy, the color would be very pretty for Valentine’s Day, too! Now I know you must be thinking that buying a whoopie pie baking pan for one holiday is a bit silly. 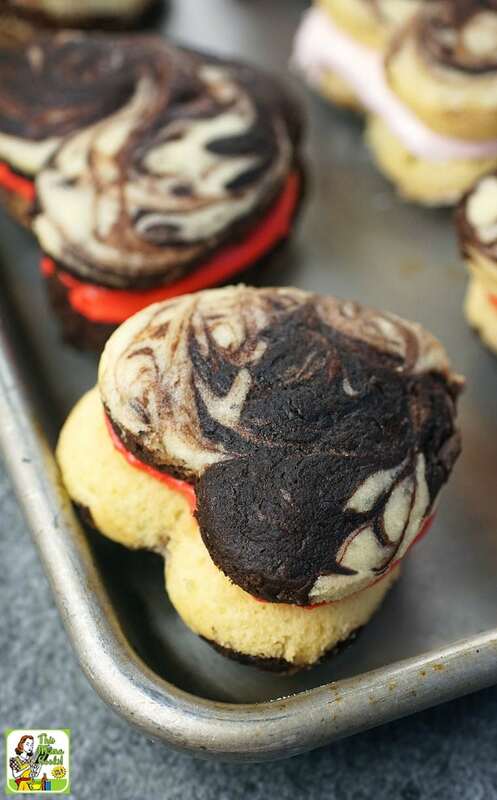 Well, you can use the heart shaped whoopie pie pan to make cookies, too. Other whoopie pie ideas are using yellow cake mix and green frosting for St. Patrick’s Day or maybe some red, white and blue frosting for Fourth of July. There are birthdays, baby showers, engagement parties, bridal showers, and class parties to bake whoopie pies for, too. If you can’t find colored frosting, use a Wilton Icing Color Set to change the color of Betty Crocker white vanilla frosting. I’ve used Wilton colors for years and love how well they work for all my baking needs. I also just bought a box of Pillsbury Funfetti Gluten Free Cake and Cupcake Mix, so the ideas for easy gluten free whoopie pies are endless! 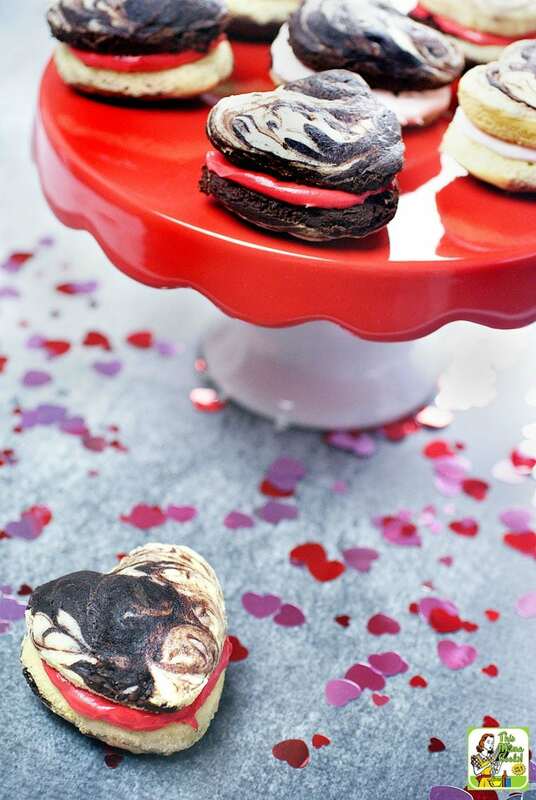 Experiment – have fun – and buy two whoopie pie baking pans – a round whoopie pie pan and a heart shaped whoopie pie pan. Or two of each! You’ll thank me when you are baking one dozen, while another dozen cool. Place the devil’s food cake mix, buttery spread, eggs, and coconut milk into the bowl of your stand mixer. Mix on low until the ingredients are incorporated. Then mix on high for one minute. Scrape down the sides of the bowl with a spatula. Then mix on high for one minute more. Pour the mix into a medium mixing bowl. Repeat with the yellow cake mix but leave the batter in the stand mixer bowl. Using a small batter spoon, scoop 2 tablespoons worth of one flavor of batter into each pan cavity. Then spoon 1 teaspoon of the other batter flavor into each cavity. Use a toothpick to swirl the batter flavors together and spread the batter evenly to the edges of the pan cavity. The cavity should be 2/3 full. Place the pan in the oven and bake for 8-10 minutes or until the top of the whoopie cake springs back when touched. Remove pan from oven and allow whoopie cakes to cool for 8 minutes before removing from pan. Wash and dry pan thoroughly. Repeat steps 5-8 (switching batter as “base flavor”) until all batter is used up. As the last cakes are baking, wash and completely dry the mixer bowl. Empty one can of frosting into the mixer bowl. Add 1/2 of the marshmallow fluff. Whip contents on high until the filling is fluffy and the color is fully mixed. Scoop frosting out into a mixing bowl. Wash and complete dry the mixer bowl. Repeat step 2 with second flavor of frosting and remaining marshmallow fluff. Leaving filling in mixer bowl. Place the flat side of a second cookie on the filling. Keep the whoopie pies as flat as possible even though the tops may be slightly uneven. If you stack them on their sides or at an angle, the top cookie may slide off. Serve them up! Easy Whoopie Pies are best eaten within a day or two. After that, they will get a bit stale. Originally published on February 8, 2016. Updated with new pictures and information. Posted in Baking, Desserts, Gluten Free, Recipes and tagged chocolate, cookies, dairy free, pie, Valentine's Day on January 9, 2019 by Anne-Marie Nichols. Wow, these look so good! I cannot believe they’re gluten-free! Thanks for sharing this recipe, it looks super straightforward. While it’s not Valentine’s Day season anymore, I might have to give these a try.